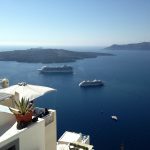 All you need to know about the Santorini Volcano, its history, how to get there and the best boat and catamaran tours. A visit to Santorini is not complete unless you visit its famous volcano, the hot springs and enjoy swimming in the Red and White beach. 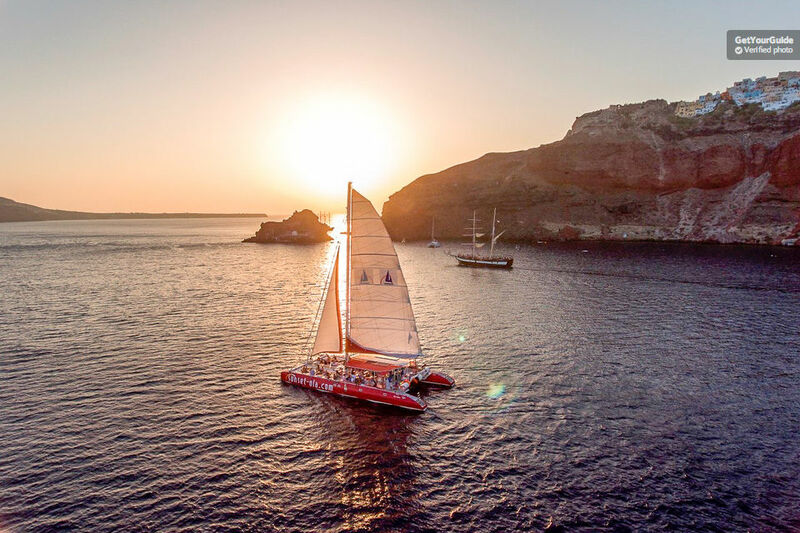 Here is all you need to know before you plan your visit to the Santorini Volcano with a boat or catamaran tour. 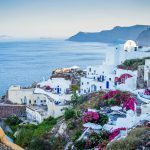 – Where is the Santorini Volcano located? 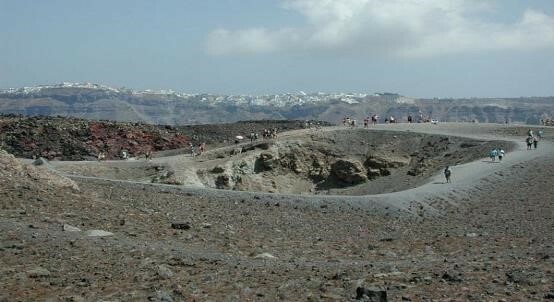 The Santorini Volcano is located on the small volcanic island, called “Nea Kameni”. It is opposite of the Santorini island and fairly close to it, as it takes around 10 minutes with a boat from Fira to reach the volcano, located at Nea Kameni. 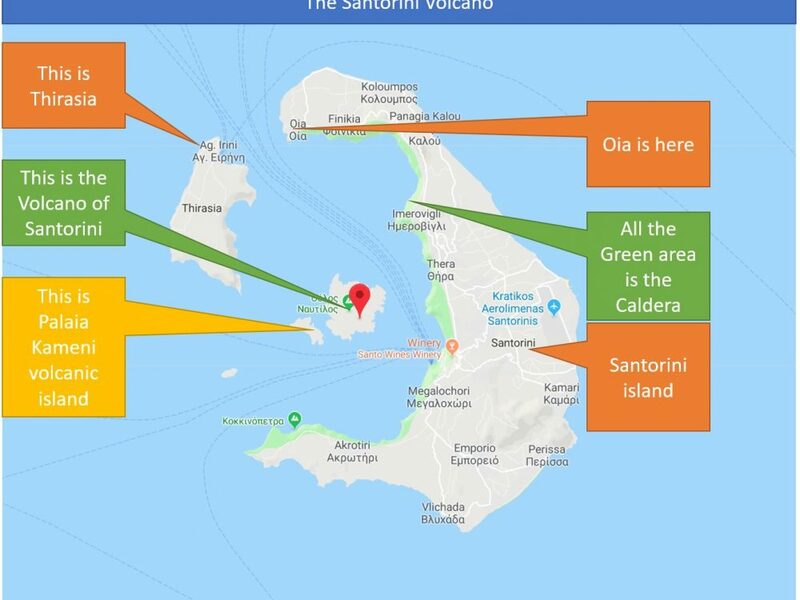 See the map below for an easy explanation of where the Santorini Volcano is located, in relation to Santorini, Thirasia, Palaia Kameni islands. If you wonder how old is the Santorini Volcano, the answer is that it is 2 million years old. Yes, the very first volcanic eruptions in the area of Santorini, started 2 million years BC. Ok, that’s a long time ago, so let’s see what happened closer to our times. 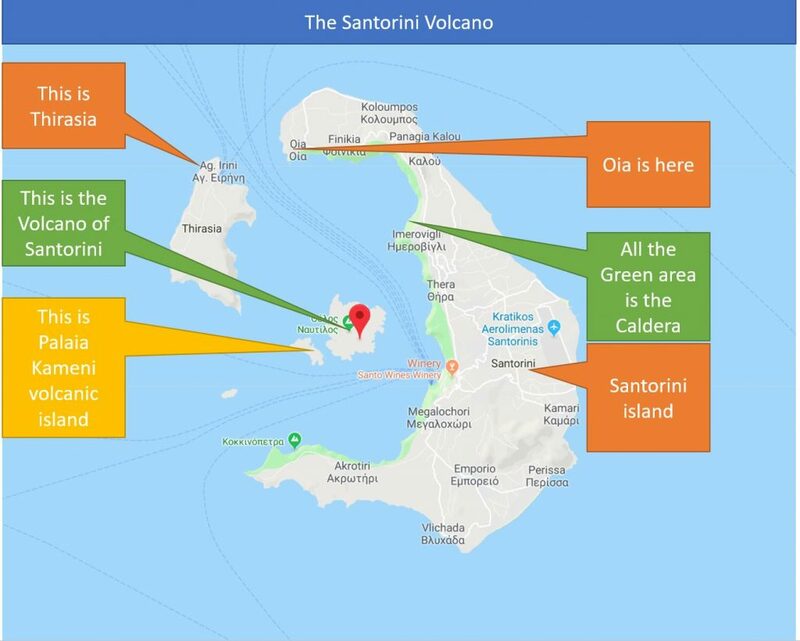 The most important eruption of the Santorini Volcano has been 2000 years BC when the eruption created a huge earthquake which formed the crater in Santorini island and gave birth to the amazing caldera and some of the small volcanic islands next to it. The most important effect of this eruption, however, wasn’t in Santorini island itself. It was in Crete island, which is around four hours by boat away from Santorini. The volcano explosion and the earthquake it created, has resulted in a huge tsunami, which hit the Crete island and has actually destroyed the most advanced civilization of Greece at that time. The Minoans. It as like an Aegean sea apocalypse. You can watch a youtube video of the history of the Santorini Volcano, here. You can also watch here a youtube video of the history and the secrets of the Minoan civilization. Santorini used to be a Minoan colony for many years in ancient times. So, when did the volcano erupt in Santorini? The most recent well-known eruptions of the Santorini Volcano have been in the years of 97 BC (created Palaia Kameni island), 1570 AD (created the Nea Kameni island), 1707 AD, 1866 AD, 1925 AD and 1956 AD. The lava magmas that came out from the eruptions once solidified have created the following volcanic islands: Thirassia, Aspronesi, Mikrà Kameni, Palea Kameni and Nea Kameni. 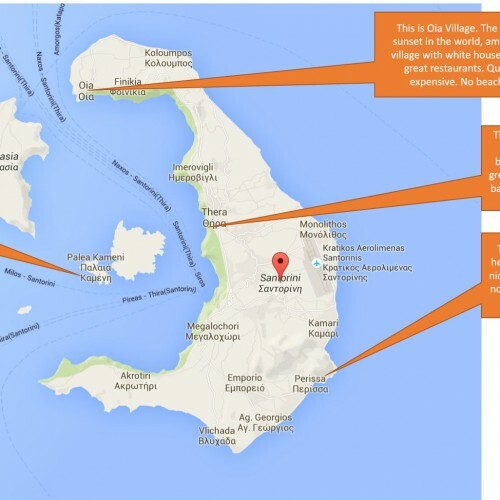 All these islands are around the main Santorini Volcano and are facing the half-moon caldera of the Santorini island. Will Santorini Volcano erupt again? Most probably yes, but no one can predict the time. Don’t worry though. The seismic activity that is evident before the volcanic eruptions will notify you well before, so you will have plenty of time to leave the island if you are soooo unlucky that a volcanic eruption occurs during your vacation to this wonderful place. A lot of people ask when was the last eruption of Santorini. The answer is that the last eruption of the Santorini Volcano took place in 1956 and destroyed part of the Imerovigli village. And if you wonder if the volcano in Santorini is still active, the answer is that yes, it is still active but in a dormant mode. So, no need to worry that is going to erupt while you visit Santorini. Volcanos don’t erupt from one moment to the other, so in the worst case scenario, they will be plenty of time to deal with the unexpected. 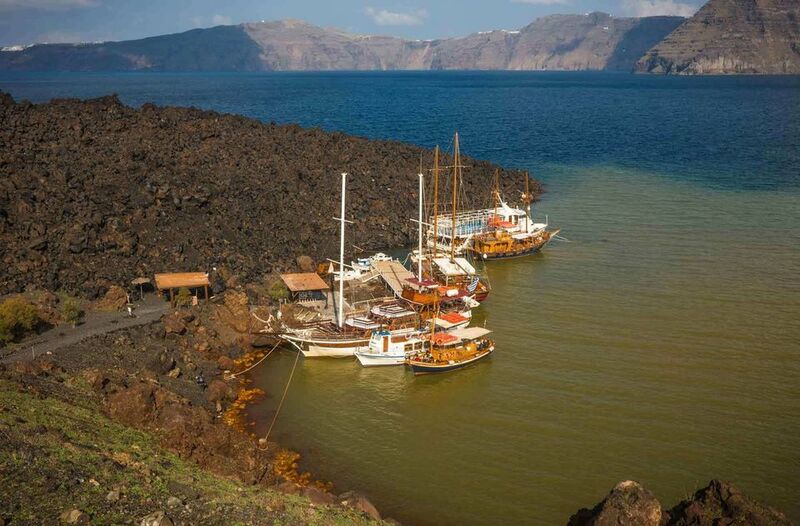 So, how do you get to the Santorini Volcano, in Nea Kameni volcanic island? There is no public boat service that connects Fira, Imerovigli, Oia or other parts of Santorini with Nea Kameni, as the latter is a small uninhabited island and there is no reason for a public transportation to existing. That means that you have to get a boat tour to go the Santorini Volcano from Santorini island. A popular stop for many tours going from Santorini to the Santorini Volcano in Nea Kameni is the area of the Hot Springs. This area is in a small cave next to Nea Kameni, at a volcanic island called Palaia Kameni (old Kameni). This is where the boat stops and you can jump in the water and swim in the thermal waters. Now, you have to be careful with swimming in the hot springs. The reason is that the water smells sulfur, so it smells really bad. And it is not clear, but muddy. Your skin and your clothes will smell bad for some hours and even days. Most probably, you will have to through away your swimming suit due to the stains it is going to have from the chemicals in the water, as you will not want to wear it again. So, don’t go to the Hot Springs with your best expensive swimming suit but get another, old and cheap one that you might get rid of easily after the boat trip. And don’t even think about wearing anything in white color, while you jump in the waters of the Hot Springs. 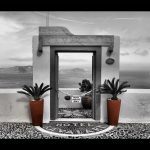 You can get a Santorini Volcano Tour from Fira, Perissa, Kamari or even other places in the Santorini island, as most of the tours offer a free pick-up and return from your hotel. The cheaper tours will not do it obviously, so you will have to transfer to the departure area. As said, you cannot get a Santorini to Volcano visit without the tour. The catamarans usually depart from Vlychada village, outside of Fira. Fira to Hot Springs to Volcano and back to Fira. Some Tours include the Red and White beach. This is a popular route for boats and catamarans that they usually pick you up at your hotel, leave from Fira, go to the Hot Springs at Palaia Kameni island, then visit the Volcano at the Nea Kameni island and return to Fira. Typically, these tours last four to five hours and leave you time for swimming and hiking in the volcano. This tour lasts 5 hours. They pick you up from your hotel, it takes you to the thermal springs, then to the volcano and they cook a bbq for you. It allows time for snorkeling and swimming in the hot springs and a couple of other bays. It costs around 100 euros per person. This tour uses a catamaran, which is an interesting experience by itself. Check prices here. The tour with this catamaran lasts for five hours and they pick you up from your hotel, with a minibus. 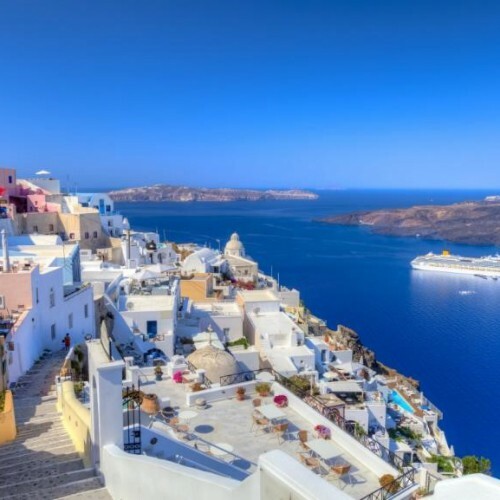 It will take you to the Santorini caldera, then to the Red and White beach for some swimming, then to the Hot Springs and finally to the Volcano. It also offers beverages and a bbq with pork or chicken. The cost is around 90 euros per person. 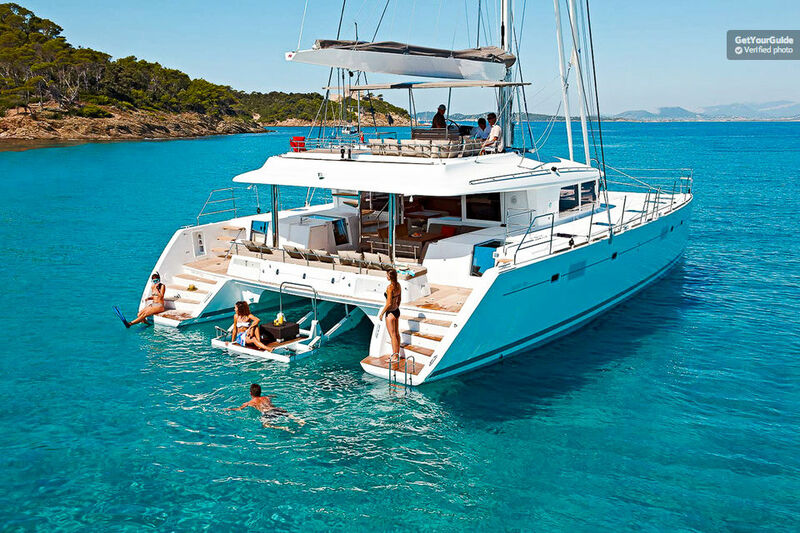 The maximum persons on the catamaran are around 50 to 55, so it’s not a private experience. Make sure to bring your own towels, as they are not provided by the tour operators. Check the prices and book it here. This is a cheaper tour, which costs around 30 euros per person. 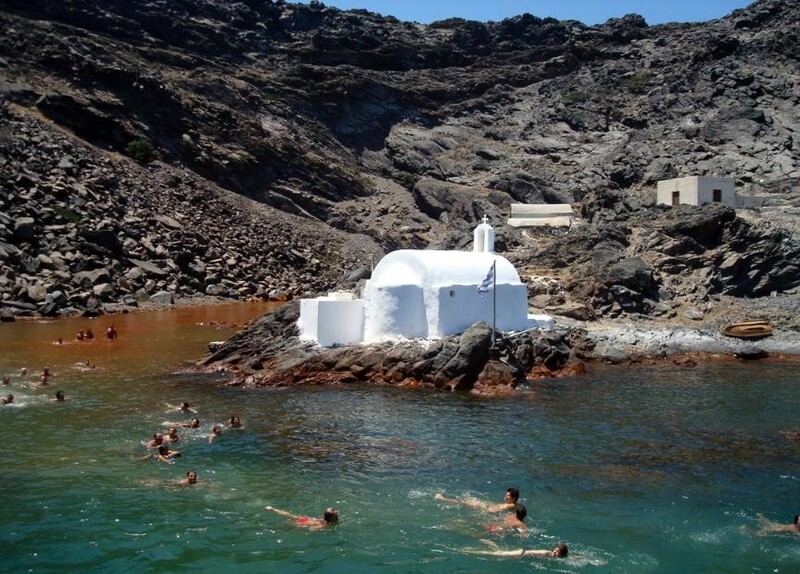 It lasts four hours and it will get you to the hot springs, then to the Volcano and back to Fira in Santorini island. 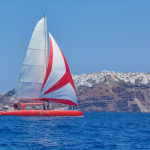 The boat used is a simpler, standard one and not a catamaran.They will also pick you up from the hotel you stay at (Kamari, Fira, and Perissa) but there is no lunch or bbq included in the tour. Check the prices and book it here. Again, this tour lasts about five hours. They pick you up from your hotel, and the catamaran will get you to the hot springs and to the Volcano. They will offer towels, so you don’t have to bring your own. They also offer unlimited wines and beverages and a greek buffet on board. 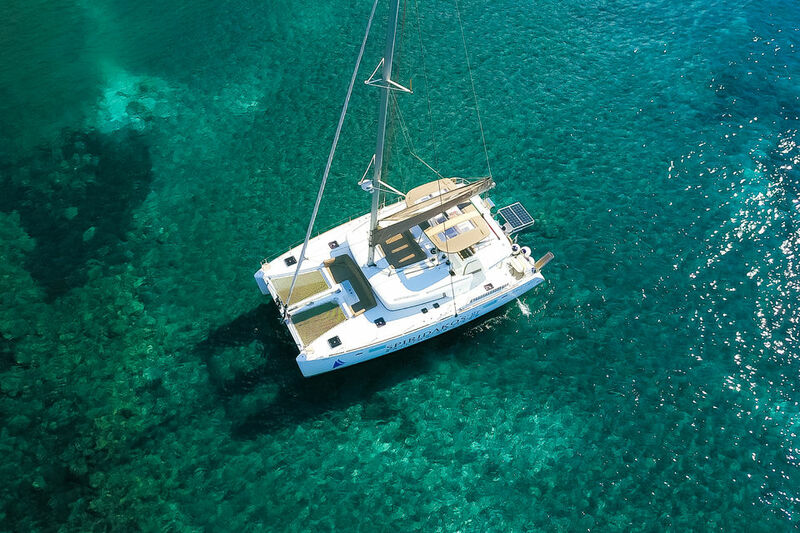 There will around 15 to 18 people on board, so don’t expect that semi-private means under ten people on the catamaran. This tour costs around 170 euros per person and has great reviews. Check the prices and book it here. This tour is on a catamaran which stops at three sites for you to swim. It lasts for five hours and it takes you to the Red Beach, then to the White beach, to the Hot Springs, and to the Volcano. 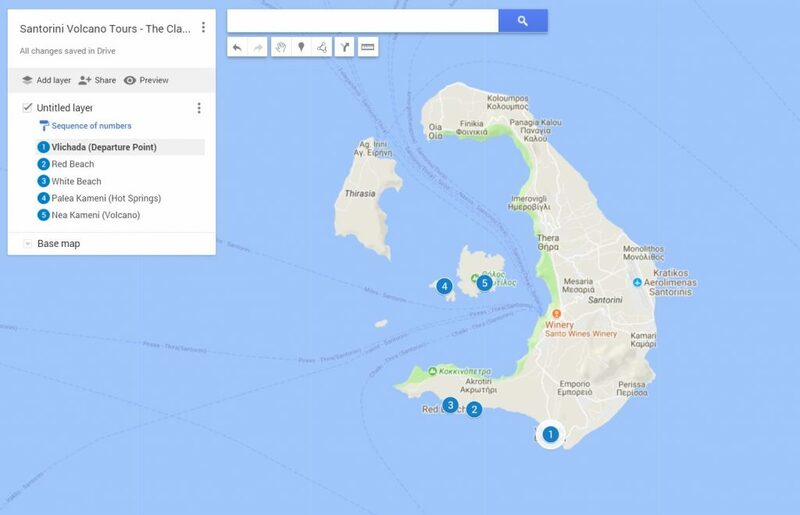 It offers barbeque, drinks, wifi onboard, snorkeling equipment and they pick you up from your hotel and return you back. It costs around 140 euros per person. Check the prices and book it here.